This Thanksgiving we went out for Chinese food. Now I can of course claim that part of the reason we did so is because half of our family heritage is Chinese. But I have to tell you, as I was walking through the supermarket on the Wednesday before Thanksgiving, I felt a little smug that I was simply picking up essentials as I walked among the folks with the glazed eyes who were stressed out over preparing the perfect Thanksgiving meal. This year I only cooked little desserts because I wanted to. This year we spent the day hanging out with each other and putting up the Christmas tree. Instead of spending quality time with my oven, I spent it with my kids. And it was sweet. And I didn’t have to do dishes after dinner. Granted, it was good Chinese. 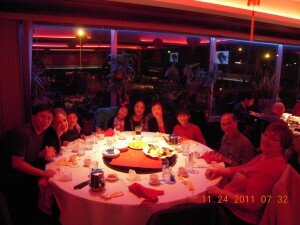 It was the place where my husband and I celebrated our wedding banquet. Sometimes it’s fun to buck tradition and do something different. I admit it. I’m a bit of a foodie. And I LOVE to cook. So when my favorite restaurant neglected to bring back my favorite seasonal dish, their sweet potato ravioli, I decided to take matters into my own hands. It was time to attempt homemade pasta. 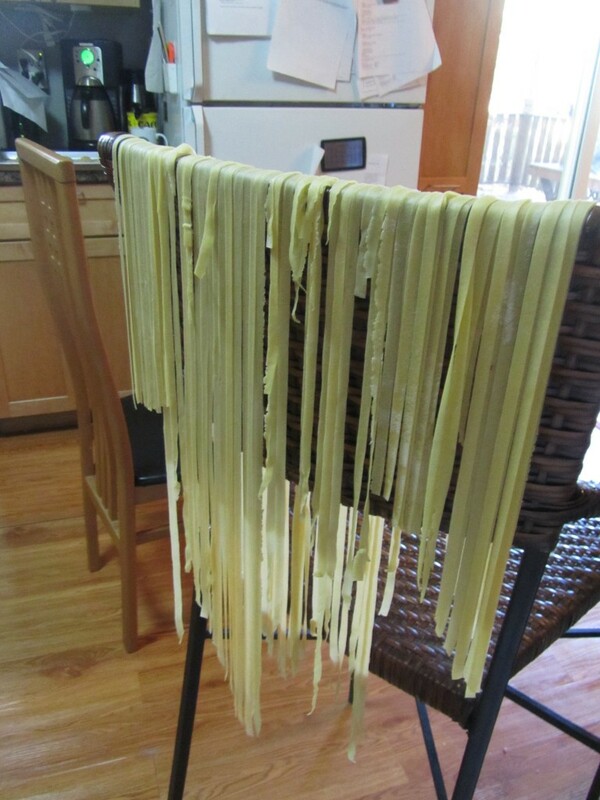 Now I have made homemade pasta once before. Just noodles, though. 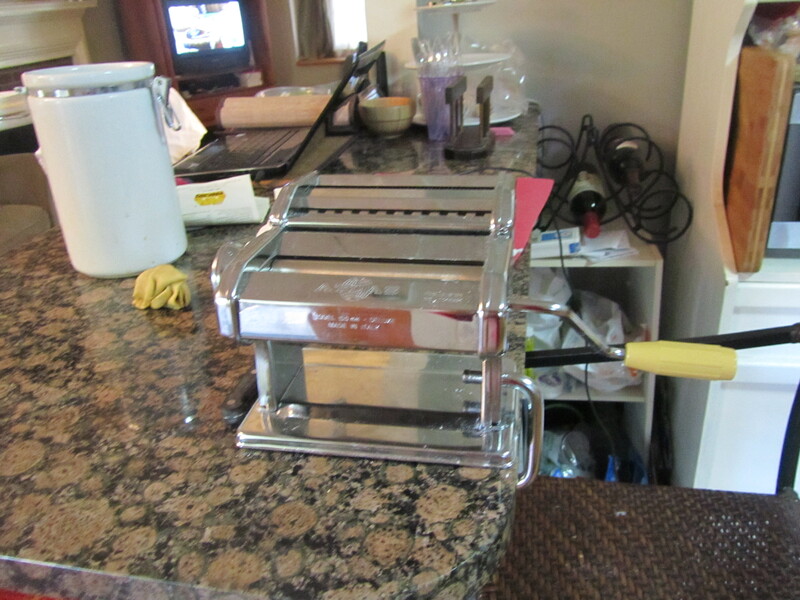 My mom bought me a hand-crank pasta machine at a garage sale years ago. I tried it once, was not impressed with the results, and then lost it in the basement. 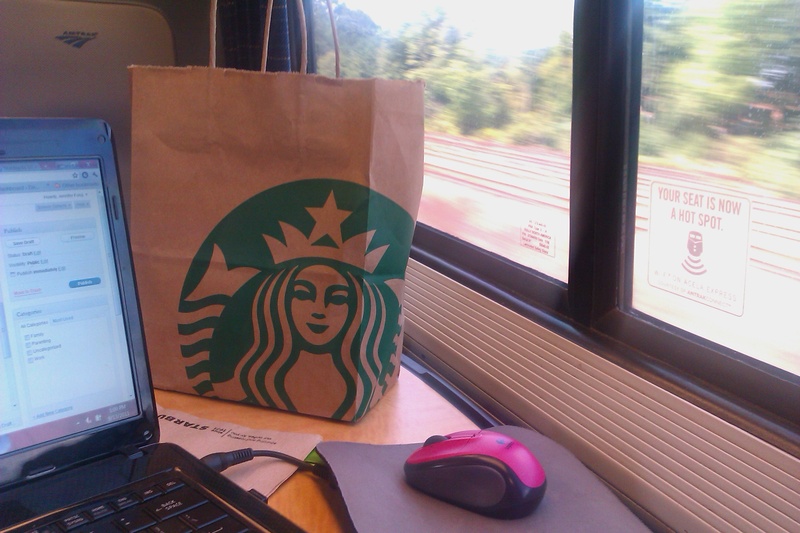 But recently it resurfaced, and has been taunting me to try again. So it was the moment. 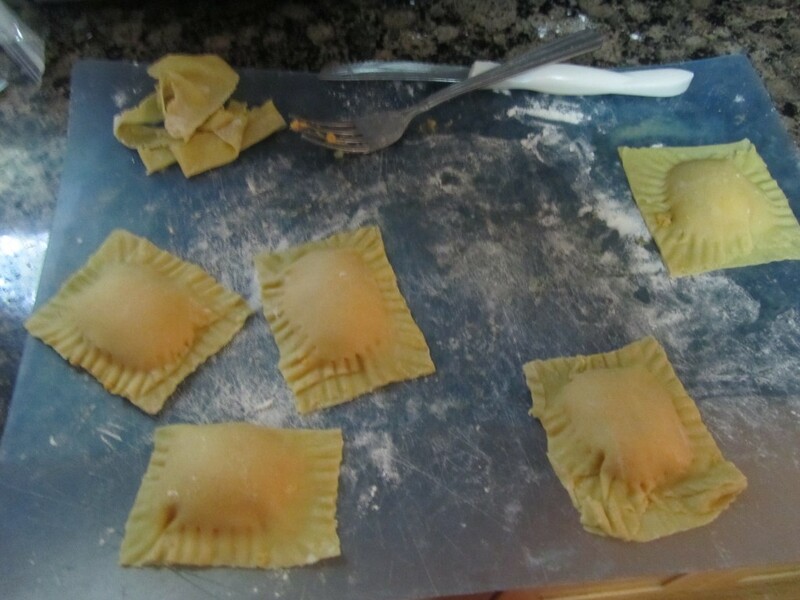 I found a recipe in Bon Appétit , along with a pasta recipe for ravioli on Food Network, and I decided to bring them together to try to replicate my favorite restaurant dish. The sauce was OK. Not the same as the restaurant. I am now going to try to sweet-talk the restaurant into giving me their recipe. 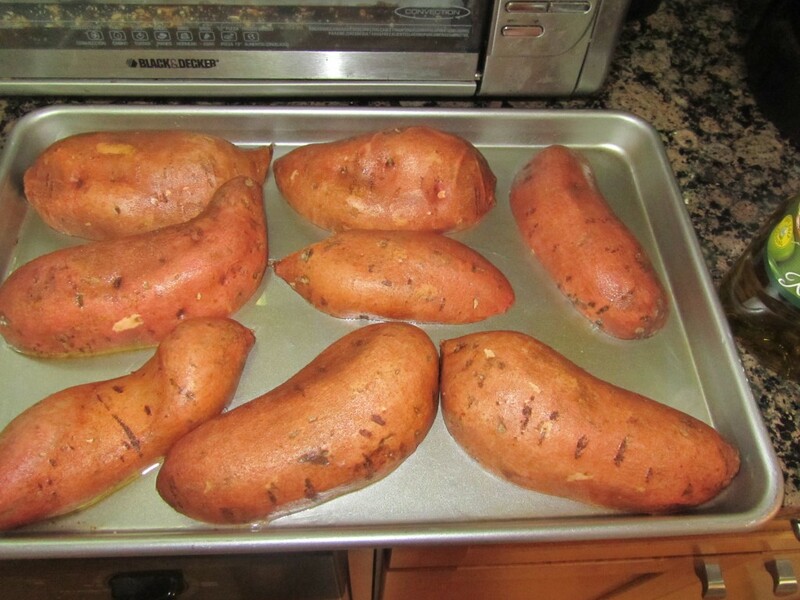 I started by cutting the sweet potatoes in half and roasting them in the oven. Next I made the pasta dough. I used the electric mixer, but kneaded by hand for 10 minutes. I considered it my workout for the day. While the dough rested, I made the sweet potato filling. I added whole milk ricotta and heavy cream to the recipe in an attempt to replicate the restaurant recipe. It was REALLY good. 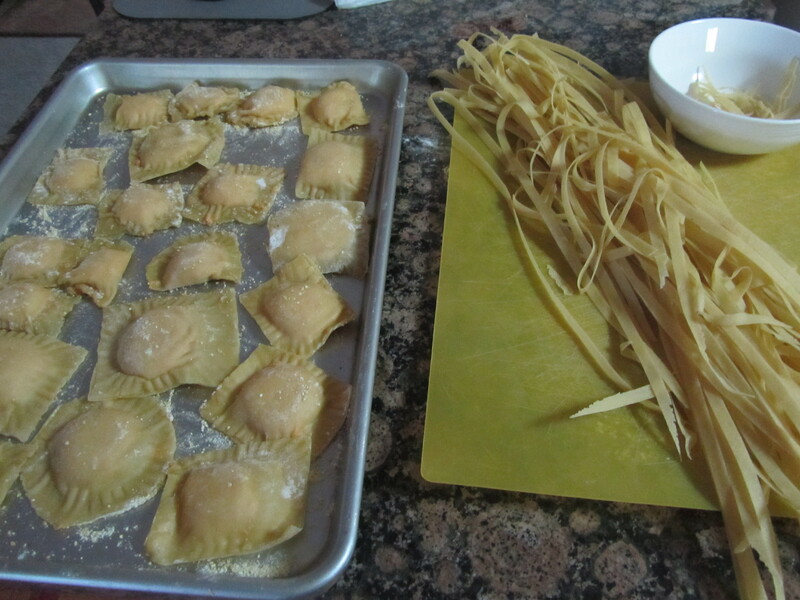 Once the pasta dough rested, I cut it into portions and ran it through the pasta machine. The kids liked helping with this part. 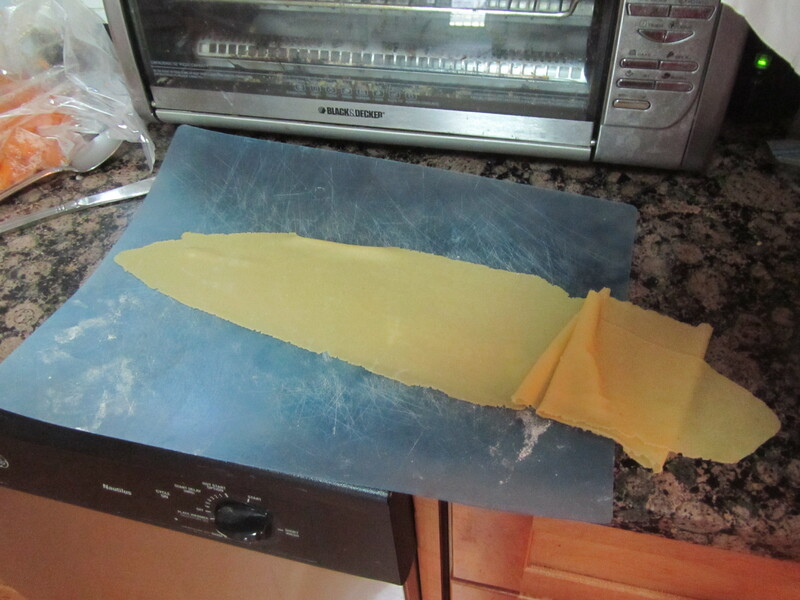 Once the pasta sheet was rolled out, I laid it on a cutting board, ready for filling! 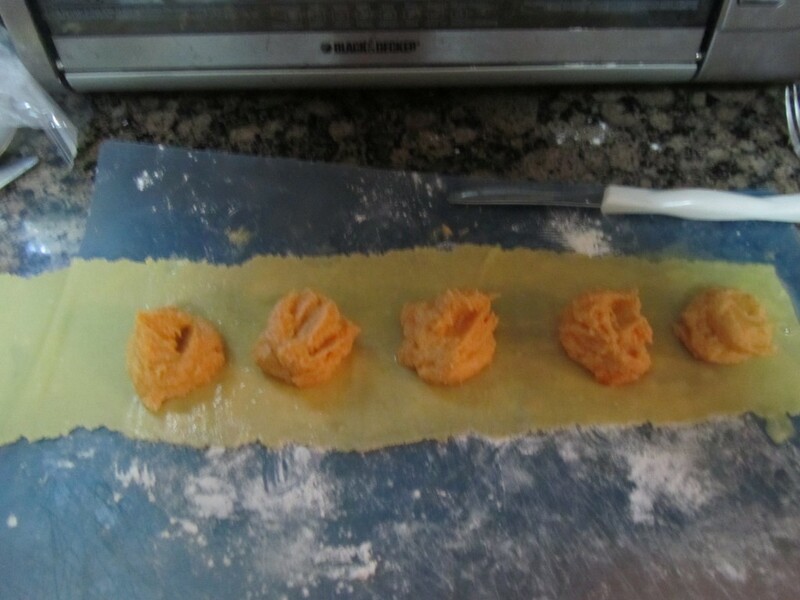 After using a pastry brush to brush the pasta sheet half with an egg wash, I placed portions of filling on half of the sheet of dough. 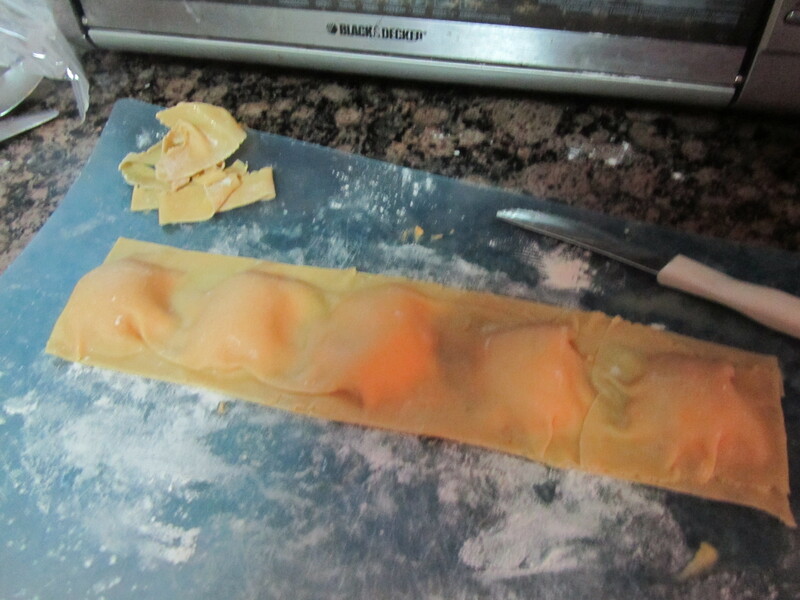 Then I folded the other half of the pasta sheet over the filling, and pressed out the air around the filling pockets. I cut the pasta into squares. If I did it again, I would use a pizza cutter. It would have been easier. Then we let everything rest and dry a bit, while I passed out. Pasta making is exhausting! Especially when you’ve been up late the night before! 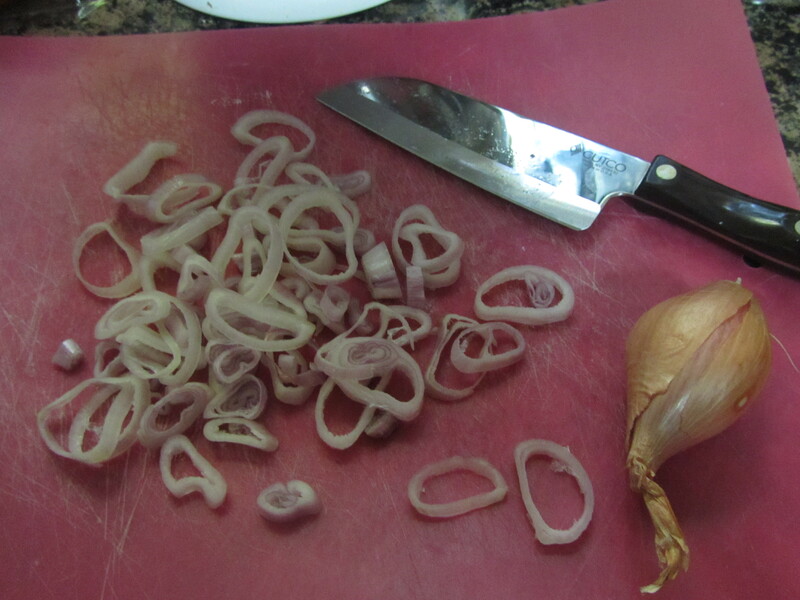 Eventually, it was time for dinner, so I started the sauce by slicing up some shallots. While the shallots fried, I browned some butter. 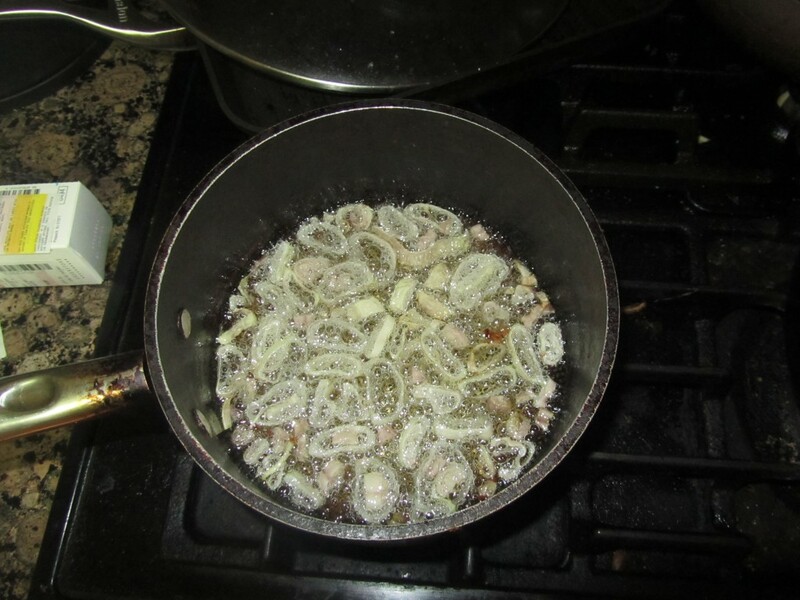 When it was done, I added some minced sage. Then I cooked the ravioli. After it cooked, I added it to the sage brown butter sauce. I added a few pumpkin seeds as well for texture (I was out of pine nuts, which the recipe called for). Then I plated it. The verdict: It was OK. 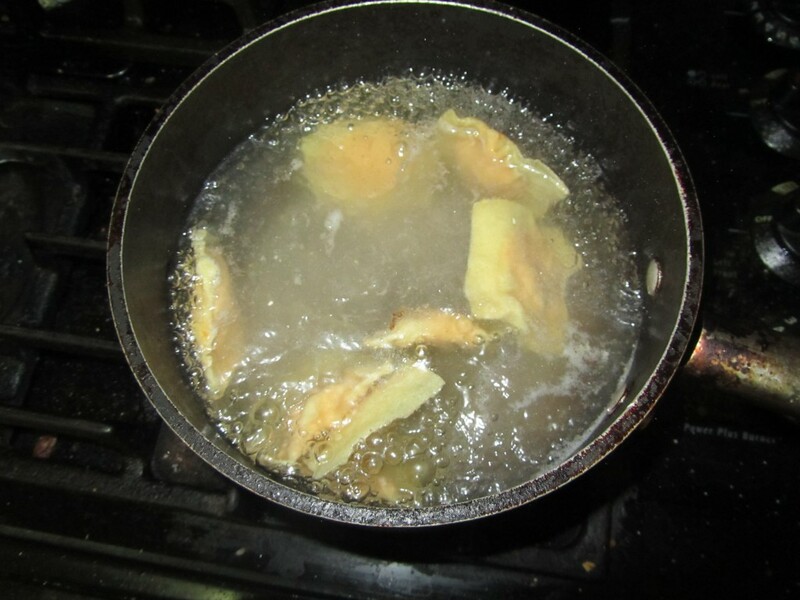 I wasn’t a huge fan of the fried shallots (not a big fried food fan.) The ravioli themselves were delicious. Fortunately I have more ravioli in the freezer, and will try another sauce recipe next time. The noodles I served with homemade meat sauce were a HUGE hit with John and the kids. I will definitely make that again. 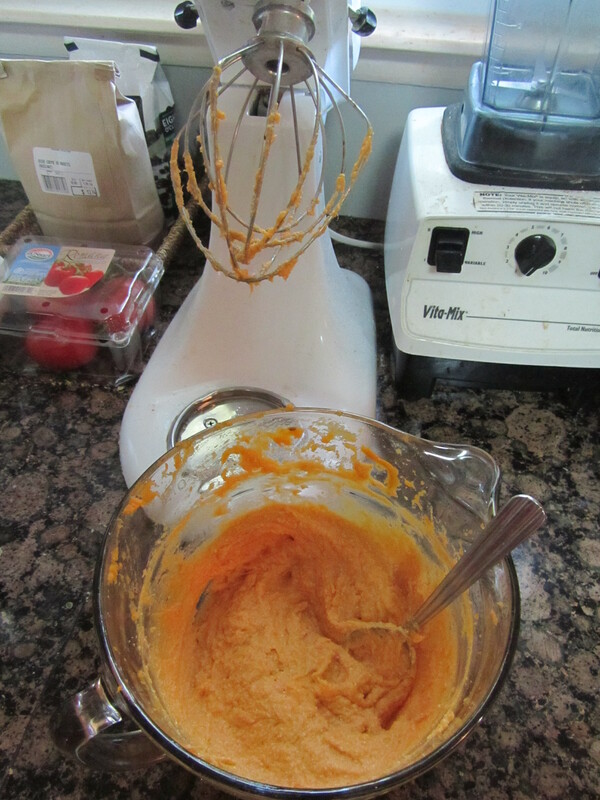 And I’m still on a quest for the perfect sweet potato ravioli sauce! 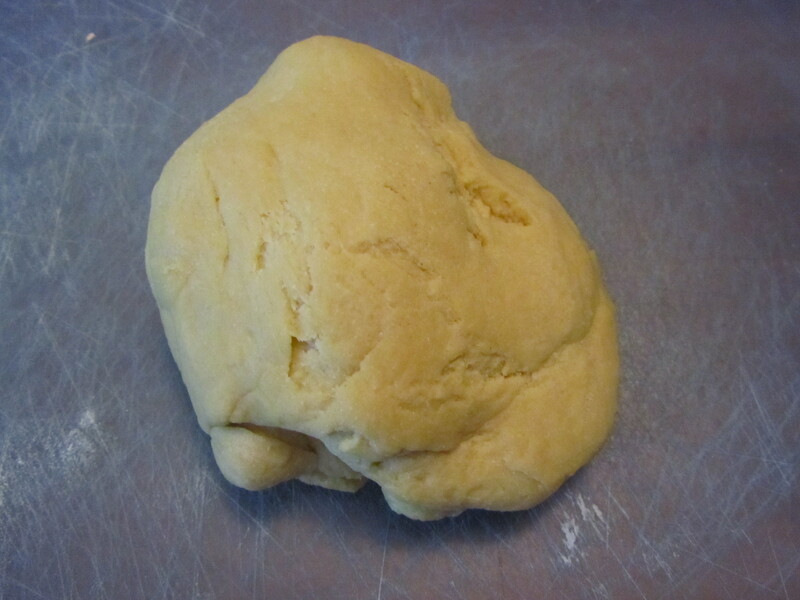 Pasta Dough for Ravioli – I used Tyler Florence’s recipe and it was easy and delicious. 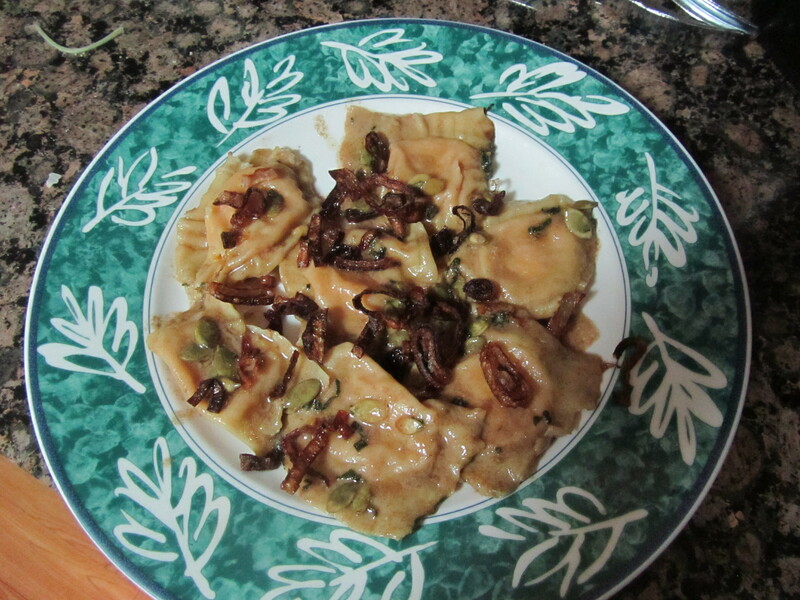 Sweet Potato Ravioli with Sage Butter Sauce – The original recipe called for using wonton skins. I used the homemade pasta instead. I added 1/4 tsp salt, 1/4 cup heavy cream and 1 cup whole milk ricotta to the filling recipe. 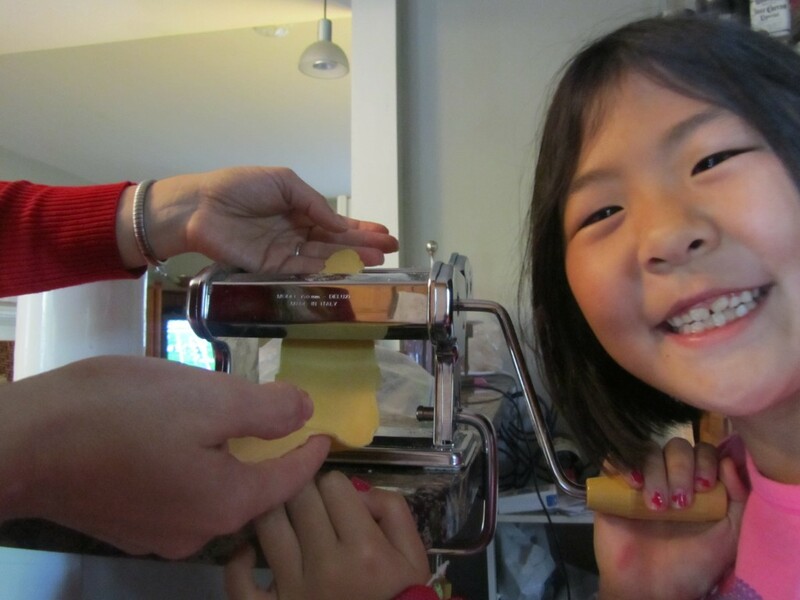 Have you made homemade pasta? Would love to read your experiences in the comments below! I’ve written before about how we’re Head Class Parents for 2 of our 3 kids’ classrooms. That means we’re in charge of organizing the annual Halloween Party for these classrooms. We’ve met with the parents and are in the midst of planning. But our school, like many others, has gotten really strict about the food. Anyway, here are some healthy snack ideas that the parents in our classes have come up with. Would love to hear if you have any other healthy ideas to share! Popcorn “Hands” – Fill plastic gloves with popped popcorn and serve! Apple “Teeth” – Take apple slices, and cut a slit along the peel side. Add black raisins in the slit as teeth. Fruit Kabobs – Black and orange fruit on skewers (oranges, blackberries, etc.) It’s color themed! 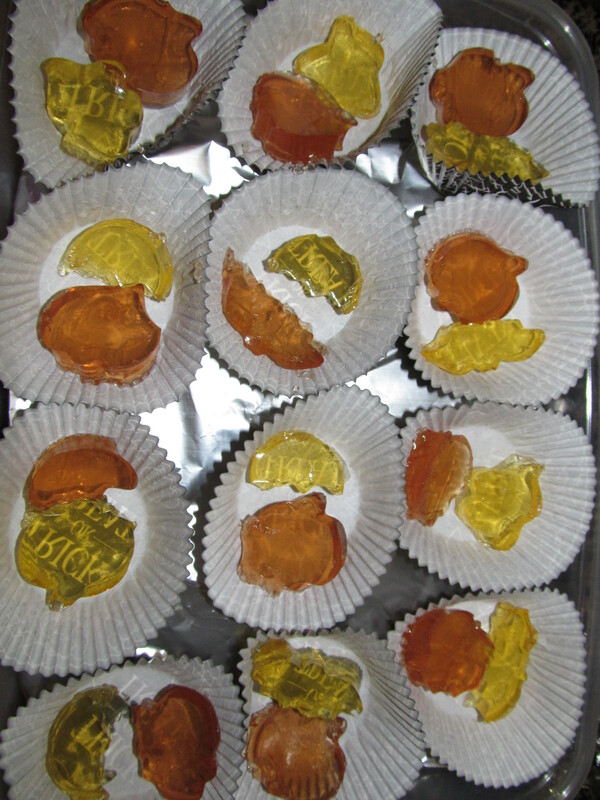 100% Fruit Juice Jigglers – Boil 100% Fruit Juice and then add Knox unflavored gelatin (follow the directions on the back of the Knox packet.) Pour into a 13″ x 9″ pan and refrigerate to set. Then use Halloween-themed cookie cutters to cut out fun shapes. Serve on Halloween-themed cupcake liners. So what other healthy Halloween treats do you serve at class parties, or with your kids at home? Would love to read your thoughts in the comments below!